Concentrated formula accelerates skin whitening. Lightens dark spots, neck, knees, elbows, groins, scars. Concentrated formula accelerates whitening. 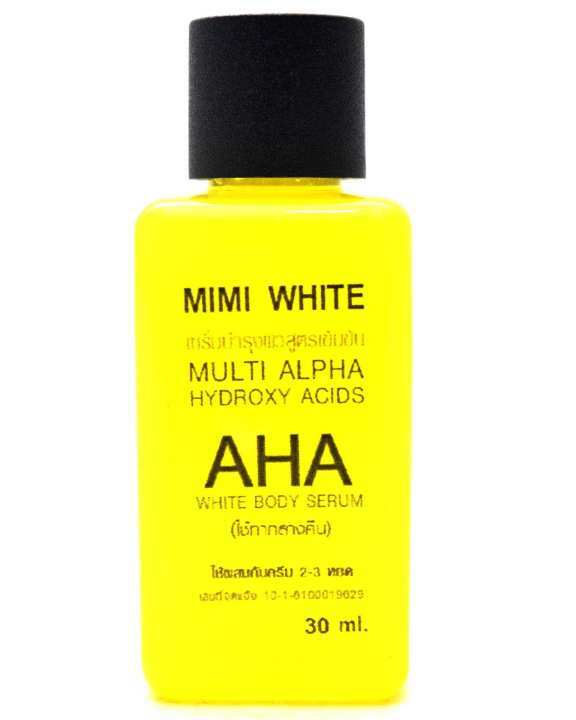 MiMi White AHA, Mix 2-3 drops of the serum with your favorite lotion or cream. How to use: Mix the with lotion or cream, apply 2-3 drops. Apply at Night ONLY! Must always use sun protection and avoid sun exposure. The product works on dark neck, knees, groin, buttocks, arms, armpits, dull skin and uneven skin. FOR EXTERNAL USE ONLY. DO NOT INGEST! SAFETY: Before use, perform a SPOT TEST to test for sensitivity as follows: Apply or rub to a patch of skin on the inner, lower arm. Rub it in and allow it to dry on the skin. Do not wash that area of the skin for at least 24 hours; watch for signs of reaction. If rash, burning, tingling, or inflammation occur, immediately remove the product from skin and discontinue all further use. mekath ekka MiMi serum eka labenawada? You can mix this with the MIMI white serum as well. However we recommend you follow the suggested ideas as mentioned in the product description.